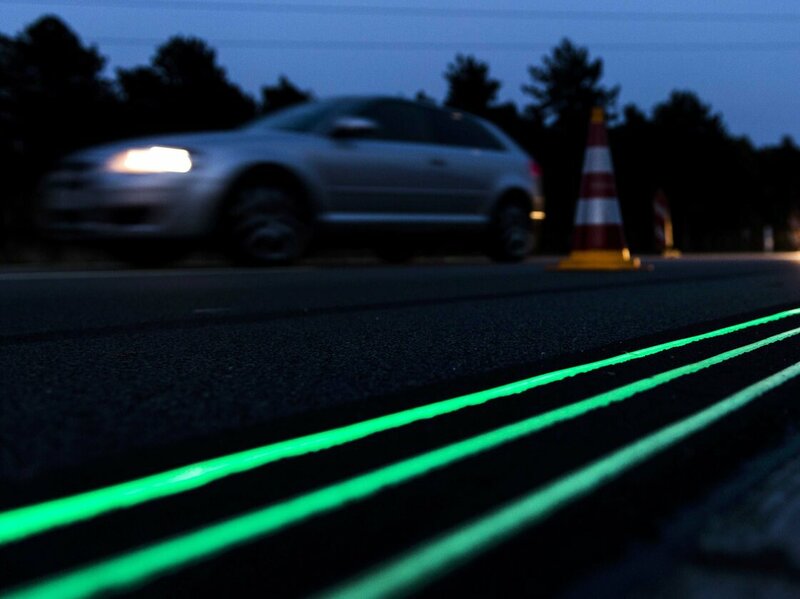 Glowing Lines are tested earlier this month on a highway near Oss in the Netherlands. The road markings absorb light during the day and emit the green glow at night. There's a half-kilometer stretch of road in the Netherlands that looks a bit like something out of the movie Tron, thanks to new luminescent markings that glow green in the dark. The photoluminescent paint, a sort of amped-up version of what is found on many wristwatches, charges up during daylight hours and then emits the green hue at night along the short test patch of N329 highway in Oss, according to Dutch companies Studio Roosegaarde and Heijmans, a road construction firm. "It's almost radioactive," says artist Daan Roosegaarde, who envisioned the project as being a sort of "Route 66 of the future," according to Wired, which says part of the ultimate vision is for "weather markings — snowdrops, for instance, [to] appear when the temperature [reaches] a certain level."